Core—This tab displays all metadata associated with your application and all the sandboxes where the application has been installed. Application metadata is shared with all packages. Packages—This tab displays configuration options specific to an application package. You can create individual packages so multiple developers can work on the same application. Package configurations are not shared between packages. You must download application files from each package and merge them using your own source control system. Refer to Kibo eCommerce Applications for more information about configuration options. Note: The Release package is created by default when you create an application and cannot be deleted. Release Notes—This tab displays release notes for a selected package. You can add notes to record changes, describe development workflows, or provide instructions for working with applications. Tip: Make sure you’ve selected the correct package before you start making changes so that you don’t overwrite another developer’s package configuration. Kibo eCommerce uses an application key and shared secret for authenticating your application. The application key is composed of four elements: <Dev Account namespace> . <Application ID> . <Version number> . <Release package>. The dashboard lets you show or hide the shared secret. Note: When you’re finished testing a custom application, you must submit it to the Kibo eCommerce certification process. Only certified applications can be deployed to a production tenant. Refer to Kibo eCommerce App Certification Guide for Third Party Development for more information. The Kibo eCommerce App Marketplace provides a library of applications and integrations for the Kibo eCommerce platform. You can use the marketplace to browse applications developed by both Kibo eCommerce and third parties to extend the functionality of your Kibo eCommerce site and evaluate the capabilities of solution partners to enhance the functionality of your storefront. If you already have a Dev Center account, you can install some licensed applications on a sandbox directly from the Kibo eCommerce App Marketplace. You can also install licensed applications from another Developer Account to which you’ve been granted access. Refer to Install an Application for more information. Not all applications can be installed on a sandbox directly from the Kibo eCommerce App Marketplace. Contact Kibo eCommerce for assistance with applications that cannot be directly installed from the marketplace. Some applications require Arc.js and are clearly marked as such on the Kibo eCommerce Marketplace. You cannot install these applications if your tenant hasn’t been Arc.js enabled. Some Kibo eCommerce-developed applications and integrations need to be configured after installation. Refer to the Kibo eCommerce Integrations Documentation Site for more information. Dev Center lets you work collaboratively to create applications. Kibo eCommerce uses the concept of "file-based applications" which means you can download a file-based representation of the application definition to work on collaboratively with your team using your own source control process. Release packages: Release packages contain all the files the developer intends to upload when submitting a theme for final certification. Development packages: Adding a development package lets you have your own unique workspace with your own details, behaviors, events, attributes, and capabilities. If you want to share package elements between packages, you can clone a package. Download the Release Package set of files and managed these file locally using a source control system. Create packages on the Packages tab for each developer. Divide the files and assign individual packages between developers within the same Dev account. Each package represents an individual work space where a developer can upload and download his files as needed for application development. Each developer works on the assigned files individually within the developer&apos;s package. When the developer finishes, the developer works with the local source control system to merge his work into the source control system. Upload the files that compose the Release Package back into Dev Center. Because this is a fluid process, work continues in this fashion until the application is complete. You must give an application a unique name and ID. Click Develop > Applications > Create Application. Enter a unique application name and ID. Double-click the application you want to configure. If your application includes a graphical interface that the client must user to configure the application, enter the URL in the Configuration URL text box. Provide a description of the application’s purpose in the Package Description text box. Whether you create a package to work on an application using the Dev Center user interface or to create a collaborate developer environment, a new package lets you work on an application without affecting the Release package. A new package does not contain any package details from the Release Package. If you want to create a new package that contains previously created details, behaviors, events, attributes, and capabilities, you need to clone the package. Complete the following procedure to create a new package. Double-click the application you want to open. The new package is listed in the Active Package drop-down menu. Note: Always verify you are working in the right package. Select the package you want to clone from the Active Package drop-down menu. You can rename any package, except for the Release Package. Double-click the application you want to rename. Select the package you want to rename from the Active Package drop-down menu. The renamed package is listed in the Active Package drop-down menu. You can delete any package, except for the Release Package. Double-click the application you want to delete. Select the package you want to delete from the Active Package drop-down menu. The package is no longer listed in the Active Package drop-down menu. Behaviors represent the functions of your application. Select the package you want to configure from the Active Package drop-down menu. Repeat for as many behavior categories as necessary. The selected behaviors appear in the Behaviors area of the Application Editor. The authentication ticket encrypts the set of application behaviors in the access token. When you configure an endpoint, you can subscribe to one or many events. To view these endpoints after configuration, expand the endpoint from the Events grid on the Events tab. To understand events and why you may want to configure them, refer to Event Subscription. Note: Only applications in the "In Development" state can be configured. Double-click the application to which you want to add an event subscription. In the Endpoint text box, enter the URL to which push notifications of the event will post. In the Event category list, select a category. In the Event list, select an event. Repeat for as many event categories as necessary. Test the event to verify push notifications are sent to the associated endpoint. When the subscribed event occurs, a notification is sent to the specified endpoint. Select the event you want to delete and then right-click and select Delete. The subscribed event no longer appears in the grid. As you develop your application, you might discover that you require a customer, order, or product attribute for your application&apos;s implementation to work. For example, if you are developing a tax capability, you might require each product in a site&apos;s catalog to have a defined "tax code" attribute. After you create the custom attributes necessary for your application in your development tenant, you can import them into your application configuration in Dev Center. 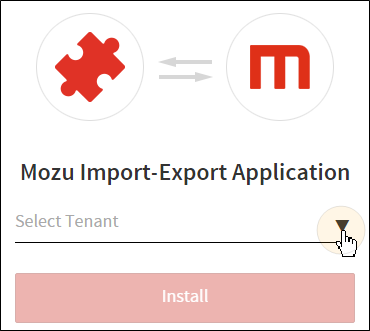 When a client installs the application, the installation automatically configures all attributes associated with the application so that the client does not have to recreate them in Admin. For example, if an application includes a Boolean product property attribute called "Taxable" and a customer attribute called "Tax exempt," after installing the application, the attribute definitions appear in Admin. When an attribute is configured in Admin and the application which contains the attribute is installed in a sandbox, you can import existing attributes into an application using Dev Center. The Attribute tab lets you import attributes from a sandbox and display the attribute values in the Attributes grid. Attribute name The attribute name created in Admin. Attribute FQN Either <namespace>~<attribute name> or <Dev Account Namespace>_<Namespace value>_<Attribute name>. Entity The entity is the attribute category, which is Product, Customer, or Order. Input type When you create an input type in Admin during the attribute creation process, you can select from List, Text box, Text area, Yes/No, Date. Data type When you create an input type in Admin during the attribute creation process, you can select from text, number. dateTime, or string. Attribute value This displays the attribute value set up in Admin when the attribute was configured. These values vary depending on the selected input and data types. Actions Use the Gear icon to select a Delete action. When you import attributes from a sandbox, the sandbox you select has an impact on what displays in the form. If you change the selected sandbox, then the attributes that were previously listed are lost. When you select "Import," it always overwrites whatever is currently in the application with whatever you choose in this task. The attribute namespace lets you configure either a unique namespace or lets you share a namespace with other applications or attributes. When you use the same attribute namespace, you share data. Complete the following procedure to import the customer, order, and product attributes required for your application into the application&apos;s configuration. Attributes must have unique names. Importing attributes with names that match attribute names that already exist in your application will fail. Depending on what release you are using, your options may vary.Note: You must define the attributes in Admin and you must have a configured sandbox that includes attributes that you can import. Double-click the application where you want to import attributes. Enter a namespace in the Attribute Namespace text box. Select a sandbox and click OK. Select a category from the Attribute Category drop-down menu. Select the attributes to import from the Attributes list. The attributes imported from the tenant display in the Application editor under Attributes. Previously, if you imported attributes the Attribute FQN would consist of the <namespace> ~<attribute name>. Now, applications use <Dev Account namespace>_<namespace value>_<attribute name>. Double-click the application you want to download. Select the package you want to download from the Active Package drop-down menu. In Dev Center, you can configure a capability, determine the types of functionality it performs, and configure the endpoints that let Kibo eCommerce send requests to the capability. The capability configuration process begins after you have created an application and configured the Configuration URL in the Packages tab . When the capability is installed, the merchant can select the countries to enable from the list of supported countries, based on the merchant&apos;s implementation. You can edit a capability at anytime by double-clicking it on the Capability configurations grid. In this task, you configure the type of capability and the endpoints to which the capability sends requests. Note: You must have created an application and configured the Configuration URL prior to configuring the capability. Double-click the application in which you want to configure a capability. Select a capability from the drop-down menu and click OK. In the specific capability dialog box, enter the endpoint for the capability in the <capability type> endpoint URL text box. Configure other capability options (if required). This automatically creates the first version of your capability. Double-click the application that contains the capability you want to remove. Right-click the capability you want to remove and select Remove. The capability no longer displays in the Capability list on the Capability tab. Double-click the application that contains the capability you want to install in a sandbox. Installing the capability in a sandbox lets you configure, initialize, and enable the capability the same way a merchant would after installing it in their tenant or site environment. Complete the following procedure to select the active capability settings from a subset of values supported by the capability. Right-click the sandbox in which you installed the capability and click View. In Admin, click Settings > Applications. Expand the capability type category and click the capability. For each country, shipping carrier, or credit type you want to enable for the capability (depending on its capability mode), select the item to highlight it. If it is highlighted in blue, it is active. Complete the following procedure to access the capability configuration page you defined in Dev Center and configure the capability settings. Note: The configuration URL must be defined in Dev Center. In Admin, for the capability, click Configure. Define the settings for the capability and click Save. Complete the following procedure to initialize a capability with active settings and configuration. Right-click the sandbox where you installed the capability and select View. Click the application that contains the capability you want to initialize. Use the custom code provided by the third-party capability provider to initialize your capability. When the capability initializes, the Enable App button activates. Your capability is initialized and your application is enabled for use with Kibo eCommerce. To enable the capability to perform functionality for the installed sandbox tenant or site, complete the following procedure. If the Enable App button is grayed out, you must first initialize your application. In Admin, click Settings > Applications and click the application. Verify the application Initialized status is set to "Yes". After completing this procedure, the capability is ready to use. You can create and define an application using the Dev Center user interface, or you can download a file-based representation of the application definition, edit the files in your local development environment, and upload them to Dev Center. Ensure you include core.xml and packageconfig.xml in every upload. Create a zipped package of your files. Include only one package. If not, your upload fails and you are prompted to fix your package. Match the package to which you are uploading. Ensure the package to which you want to upload currently exists. The upload process ensures that the XML syntax is valid. If the XML is not valid, the upload fails and displays an error. If the validation and upload succeeds, the new settings are displayed in Packages. You can upload applications using XML files. Note: You must have a compressed archive of at least one file plus core.xml and packageconfig.xml ready to upload for this task. Double-click the application to which you want to upload files. In the file manager, browse to the compressed archive that includes your files. Your application details are now part of the package to which you uploaded the compressed archive. As you make changes to your application or theme, it’s a good idea to note the changes you make or any special instructions for working with application. Double-click the application to which you want to add a change note. Select the package to which you want to add a change note from the Active Package drop-down menu. Click the Release Notes tab. Enter comments about the change you made. Each note displays the change comment, lists the account that made the change, and displays the date the change was made. When you create an application for the first time in Dev Center, this is the first available version of the application. When coding is finished, you submit the application version for certification. If the application passes certification, it can be promoted to a production environment (in the case of tenant-specific custom applications). After you certify an application, you can create a new version. Kibo eCommerce allows for semantic versioning (Major.Minor.Revision). How you version your application is up to your in-house versioning practices. New versions must use a unique number. Complete the following procedure to create a new version. Versioning is not automatic, it is a manual process. Right-click the application you want to version and select Create new version. In the Application editor, enter the new version number. You now have a new version of your application that is in the “In development” state and must be resubmitted for certification. There’s more than one way to install an application on a sandbox. The most common way is to select from a list of applications in your Developer Account, but you can also install some licensed applications directly from the Kibo eCommerce App Marketplace or from another Developer Account to which you’ve been granted access. Double-click the application you want to install. Select the sandbox where you want to install the application and click OK. In Admin, to enable your application, click Settings > Applications. In the Applications page, verify the your application appears in the list. Your application is now installed and enabled. Log in to Dev Center using your Dev Account credentials. Click the drop-down arrow to select the sandbox where you want to install the application. If you know your sandbox name or ID, you can start typing it in the Select Tenant field to do a type-ahead search. In the Application editor, verify that your application appears in the list. Double-click the sandbox where you want to install an application. Click the Installed Assets tab. Select an account from the Developer Account drop-down menu. Select the application you want to install and click OK. When you finish developing your application and have completed the store profile, you can submit your application to the Kibo eCommerce certification process. Once you submit your application for certification, the Kibo eCommerce team reviews and certifies that it meets the criteria specified by Kibo eCommerce. Note: When you submit your application, the application version is locked. You cannot modify this version once you submit it. If you have questions about the certification process, please consult with your Kibo eCommerce Account Executive or your Partner Manager. Double-click the application you want to submit for certification. Click More > Submit for certification. The application moves into the “Pending certification” state. Applying for application certification requires additional documentation. You must complete a certification form following the set guidelines in the Kibo eCommerce App Certification Guide for Third Party Development. The guide includes the entire submission and review process, guidelines for application development, and required documentation. This is the initial status of all applications or themes. Applications and themes remain in this state until they are submitted for certification. While an application is in this status, define the application name or application version name, define pricing and licensing, and code and test applications and themes in a development store. Applications and themes enter this status after being submitted for certification, and remain in this state until the review and certification process is complete and the application or theme is accepted or rejected. After you submit, the version of the application or theme submitted is locked as well as the namespace associated with it. As the code complexity and number of applications and themes to certify increases, so does the amount of time required to complete the review and certification process. You cannot change any code or perform any actions for the application or theme while it is in this status. During this process someone from Volusion contacts you to go over the process and to inform you whether your application or theme is certified. The end result of the certification process is either Certified or back to In Development. Once certified, your application or theme can be installed in the production tenant. This status appears when Volusion certifies the application or theme. Depending on your implementation, the application may be ready for release into the app or theme store or ready to promote to a production environment if it is a custom application or theme. While an application or theme is in this state, you can only define pricing.